Brothers Henry and John Andrew were both killed in World War I. Henry was born on 11th December 1877 at Midton Farm, Howwood, Renfrewshire, the eldest of a family of seven born to Henry Andrew, from Dundonald, Ayrshire and Janet Boyd, also from Dundonald, who had married there on 15th December, 1876. In 1881 Henry (28), Janet (30), and their sons Henry and Joseph were living in Kildonan Lodge, Colmonell, a small village in South Ayrshire where Henry was a gardener. By 1891 after an itinerant few years, the Andrew family had settled in Claremont Place, off Main Street, Bridge of Weir. Henry senior was a jobbing gardener. Henry junior (13) was a grocer's message boy. By 1901 Henry junior had moved to Falkirk and was an ironmonger's assistant, boarding with the Dow family at 40 Comely Park. The rest of the Andrew family was still at Claremont Place. Joseph was an apprentice plumber, Elizabeth a domestic servant, and James a post office telegraph boy. Robert and John were at school. In 1911, five of the Andrew family were living in the same 2-roomed flat in Claremont Place. Henry senior was still a jobbing gardener; Margaret was "helping at home", Robert was a grocer's assistant and John a student teacher. Henry junior is not with the family. Joseph, a house plumber, was head of his own household in Windsor Place, Main Street, and married (to a Norwegian wife) with two children. Elizabeth had married Robert Jackson and was living in Glasgow. 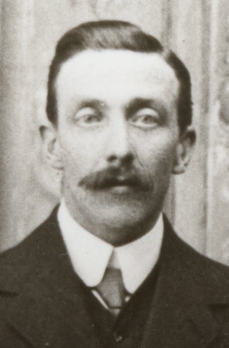 Private Henry Andrew first joined the theatre of war with the Army Service Corps on 14th April 1915 in Egypt. The ASC, or Royal Army Service Corps, was responsible for servicing all British army theatres of war. The food for men and horses, ammunition and everything else that was needed to service an army of three million men was transported by the ASC, which had more than 300,000 soldiers at its peak. Later he served in Salonica, Greece, an Allied base for operations against pro-German Bulgaria, when he became ill with a fever. Henry received medical attention in Malta and Liverpool before being transferred to the Royal Alexandra Hospital in Paisley. He did not survive operations required after complications set in, and he died on 4th January 1917, the first of the two Andrew brothers to fall. 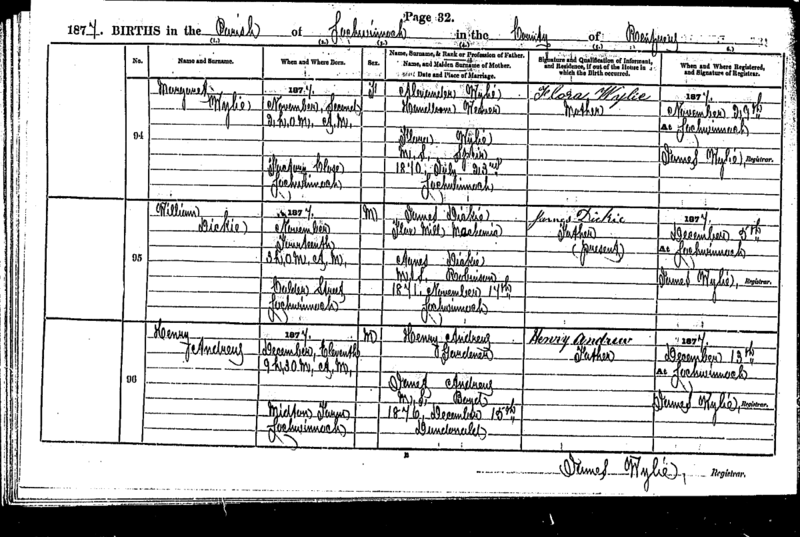 Henry Andrew birth certificate, 11th December 1877, Lochwinnoch, Renfrewshire. Regd. 13th December 1877. 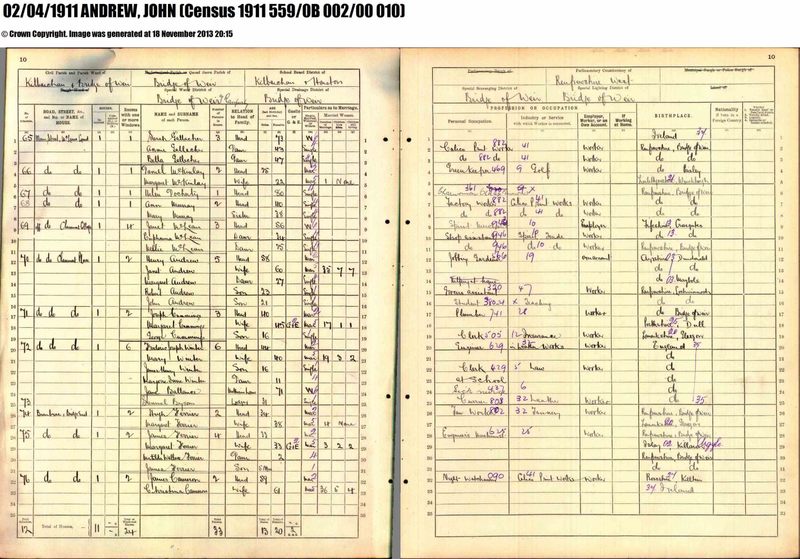 1881 UK Census: Parish: Colmonell; ED:6; Page:6; Line:3; Roll: cssct1881_181. 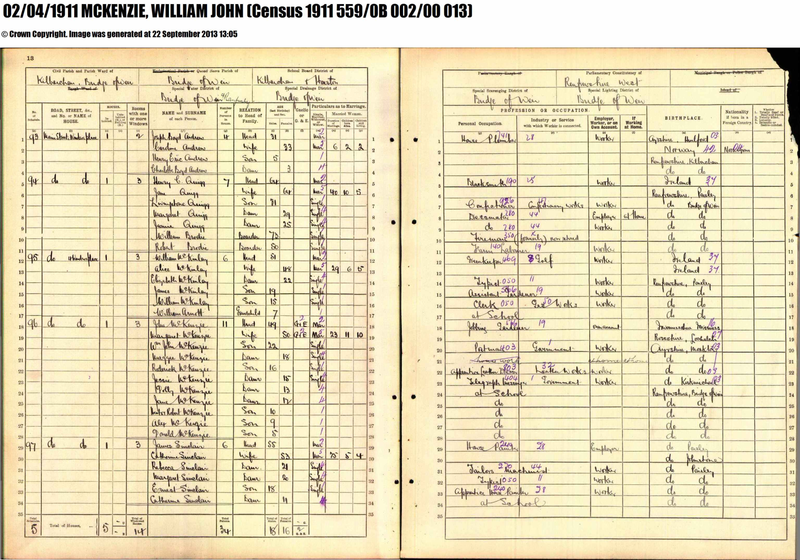 1891 UK Census: Kilbarchan; ED:8; Page:11; Line:19; Roll: CSSCT1891_185. Parish: Kilbarchan; ED:2; Page:14; Line:9; Roll: CSSCT1901_188. Parish: Falkirk; ED:5A; Page:59; Line:22; Roll: CSSCT1901_155. Ward: Bridge of Weir; Parish: Kilbarchan & Bridge of Weir. Page 13; lines 12-16. 559/0B 002/000010. Ward: Bridge of Weir; Parish: Kilbarchan & Bridge of Weir. Page 13; lines 1-4. 559/0B 002/000013. 13th January 1917: The death is announced of Private Henry Andrew ASC, eldest son of Mr Henry Andrew, Claremont-place. 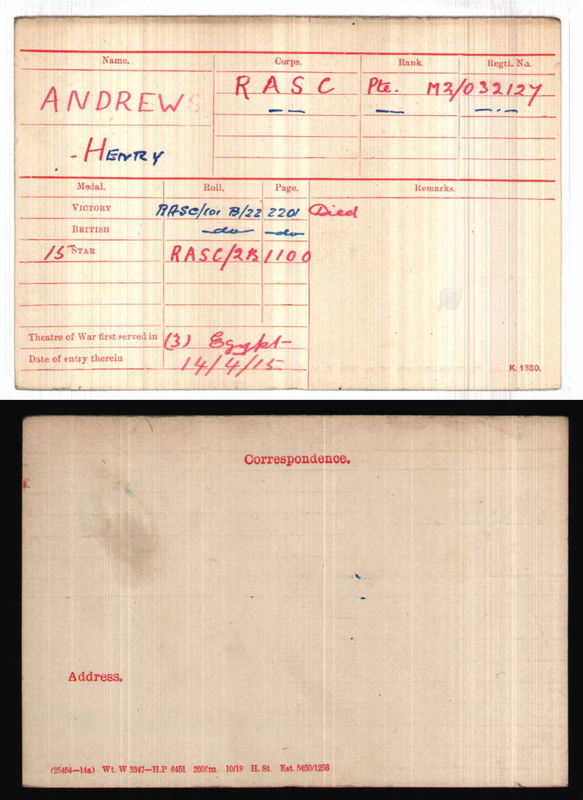 Private Andrew had been in Salonica with ASC Motor Transport, and some months ago contracted fever there. He was for a time in hospital at Malta and later at Liverpool, and had been home on leave before returning to headquarters. Complications, however, set in shortly after his return, which necessitated operations being performed, and unfortunately he had been unable to withstand the ordeal, his health otherwise not having sufficiently returned. Much sympathy is extended to his parents and family in their sore loss. Other sons of Mr Andrew are serving with the forces. 10th January 1920: - In loving memory of our Son and Brother, Private Henry Andrew who died in the Royal Alexandra Infirmary, Paisley on 4th January 1917 - To memory ever dear - Claremont Place, Bridge of Weir. Erected by HENRY and JANET ANDREW in loving memory of their son Pte. HENRY ANDREW A.S.C. who died at Paisley Alexandria Infirmary 4th Jan 1917 aged 39 years and their youngest son L.Cpl. JOHN ANDREW 7/8 K.O.S.B. killed in action in France 23rd July 1918 aged 28 years the above JANET ANDREW died 30th Jan. 1927 aged 77 years MARGARET died 1st Nov. 1927 aged 44 years "Until the day dawn".